Tenri’s urban boundaries include a number of ancient Japanese tombs, known as “cofun”. The cofun are beautiful and unmistakeable, but blend into the spaces of everyday life in the city. The plaza’s landscape, richly punctuated by several of these cofun, is a representation of the area’s characteristic geography: the Nara Basin, surrounded on all sides by mountains. The construction technique used to create the plaza’s round cofun structures consisted of fitting together pieces of a precast concrete mould resembling a huge pizza. Because precast concrete moulds are formed at the factory and then assembled onsite, the resulting structures are precise and the same mould can be used multiple times, ensuring excellent cost-performance. The pre-formed parts are pieced together like building blocks using the same massive cranes used to build bridges. Large spaces can be formed without the use of columns or beams, and because of the round shape the well-balanced structures offer stability against forces applied from any direction. The cofun’s different levels serve a variety of purposes: they’re stairs, but also benches for sitting, fences to enclose playing children, the cafe and stage roofs, shelves for displaying products and the nighttime lighting effect, which floods the plaza with light. This variety creates an environment that encourages visitors to explore and spend time in different spaces within the plaza, rather than limiting their movement to one place. It’s a “ambiguous” space that’s entirely a cafe, a playground and a massive piece of furniture, all at once. Guideposts and signboards feature gentle curves similar to those of the cofun, and are coloured a dark grey that creates a natural contrast while still fitting in with the surrounding area well. They are also arranged at four different heights according to their function in order to minimize noise levels. 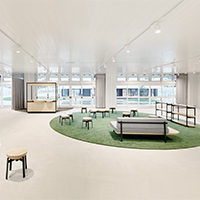 A play space for children, a lounge and study space for reading books, and a stage that can be used for concerts or public screenings have all been added to the meeting area, and Tenri souvenirs can be purchased at a newly designed shop next to the space. Every design was given to ensure that the materials and colouring of the interiors matched those of the plaza as closely as possible. 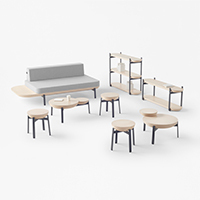 Furniture and fixtures made using wood from Nara Prefecture and designed around a cofun theme create a sense of uniformity with the plaza. 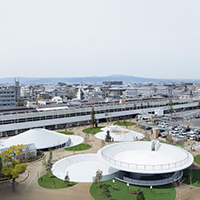 The plaza’s name, CoFuFun, combines the main design motif, the cofun, with colloquial Japanese expressions. 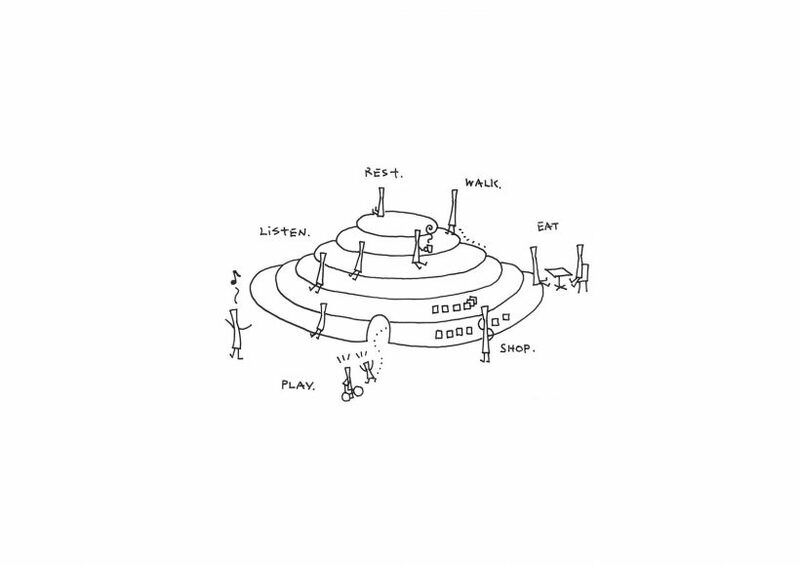 “Fufun” refers to happy, unconscious humming: the design for the plaza should offer a convivial atmosphere that unconsciously leads visitors to hum, happily, while they’re there. The alphabet spelling, “CoFuFun”, also brings in the “co-” of “cooperation” and “community”, as well as – of course – “fun” itself. The result is a name whose Japanese and alphabet spellings mean similar things, so that foreign visitors to the plaza will understand it in the same way, too.